As I think about endurance or high intensity workouts, what to eat before these sessions is important. 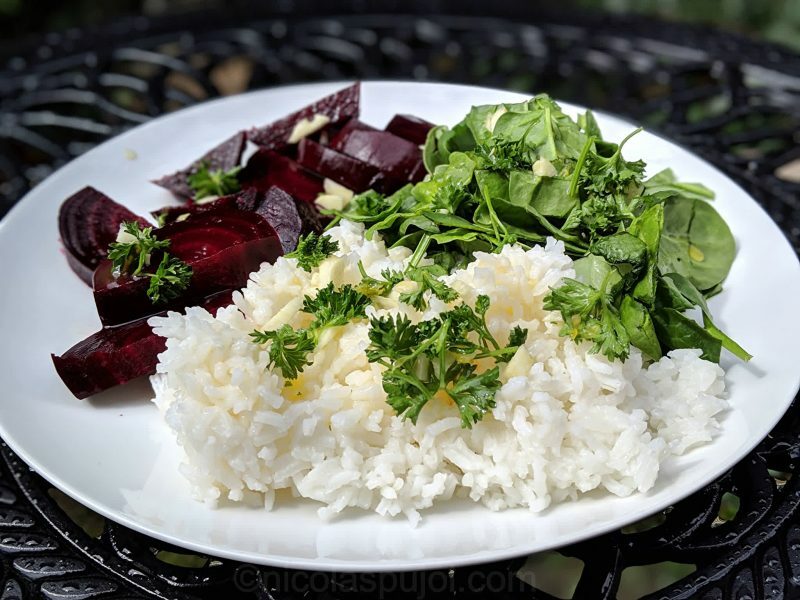 This recipe for beet spinach rice with oil-free dressing makes for a high energy, tasty and easy to digest meal for athletes and everyone. 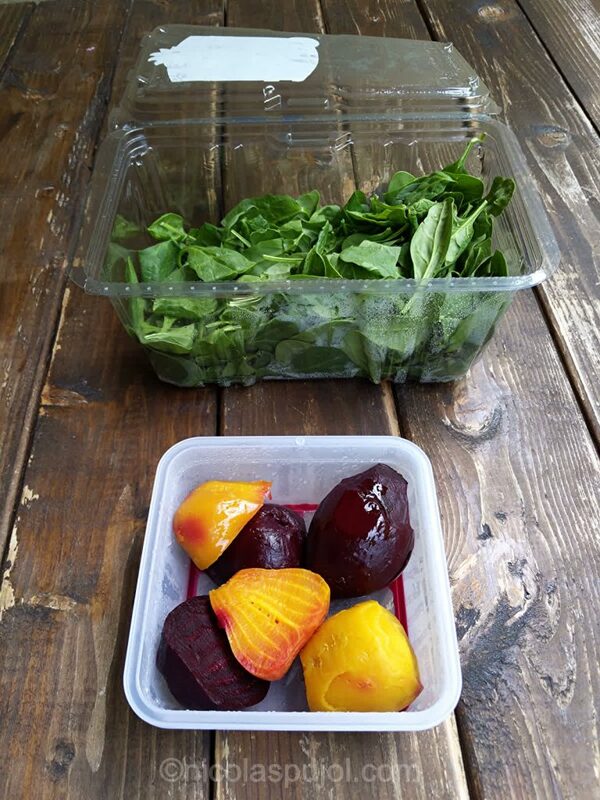 If you read about nutrition for good physical performance during workouts, there is a lot of attention given to the wonderful beets and spinach. Spinach has long carried a reputation for making us strong thanks to its iron content. Recall the cartoon character Popeye who would do magic after eating them. But beets are somehow the new kid on the block. They are very nutritious across their vitamin content, micro-nutrients, especially because beets and also spinach are high in nitrates. Nitrates in vegetables would contribute to blood vessel function, and help with endothelial function specifically. The endothelium represents the fragile inner lining of blood vessels. It is believed to play a key role in athletic performance as well as a protector against various risks for illness. Dr Esselstyn mentions the endothelium in almost every talk he gives. While nitrates make no miracle, they are believed to act as raw materials for the body to make nitric oxide, which helps protect the endothelium. They also increase the ability for vessels to dilate. For high intensity workouts, this would mean higher carrying of oxygen to the muscles. These are some reasons why these veggies are looking appealing to the athletic community. But regardless of doing a workout or not – and the latter can just be going for a walk or gardening. Beets and spinach are delicious. I paired this recipe with rice, to make sure I would feel satisfied and no longer hungry after the meal. For flavor I decided to change from the traditional lemon mustard dressing for an orange vinaigrette, which is oil-free. In my experience, it’s a good idea not to go overboard with oil and fats in general, especially before a workout. 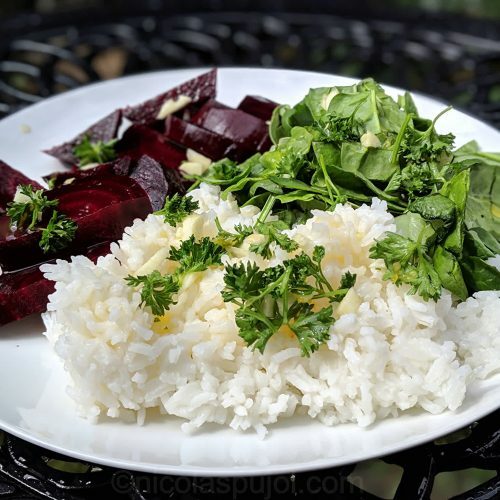 This beet spinach rice with oil-free dressing can work as a main meal. You can also eat it as a salad if you limit the amount of rice. That way you keep some appetite for an entree after this. 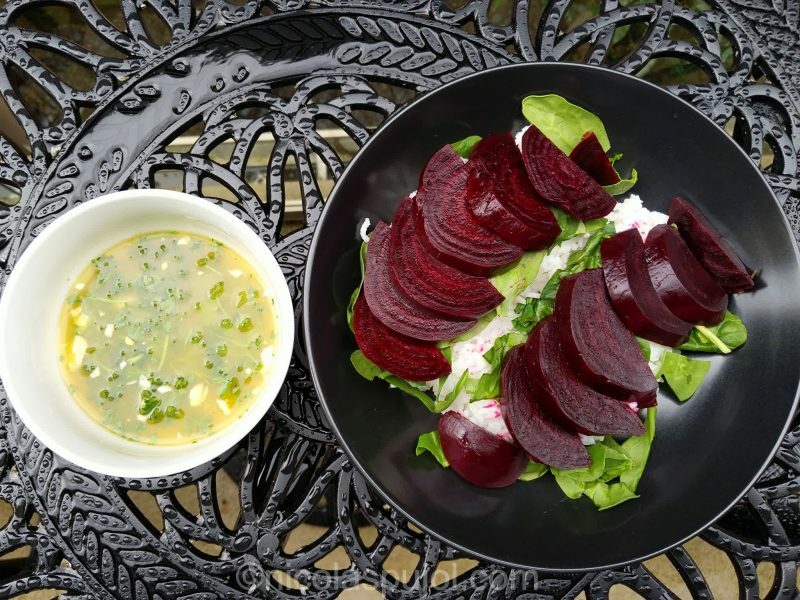 At any rate, I will be testing more dishes with beets and nitrates. This will include measuring if it makes a difference on workout performance. At first glance, things look good! 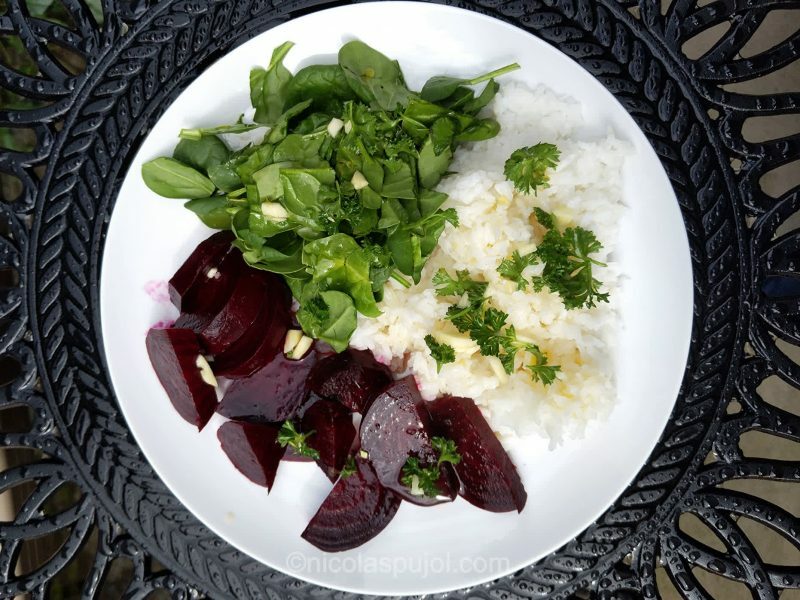 This recipe for beet spinach rice with oil-free dressing makes for a high nitrate, tasty and easy to digest meal for athlete workouts and for everyone. 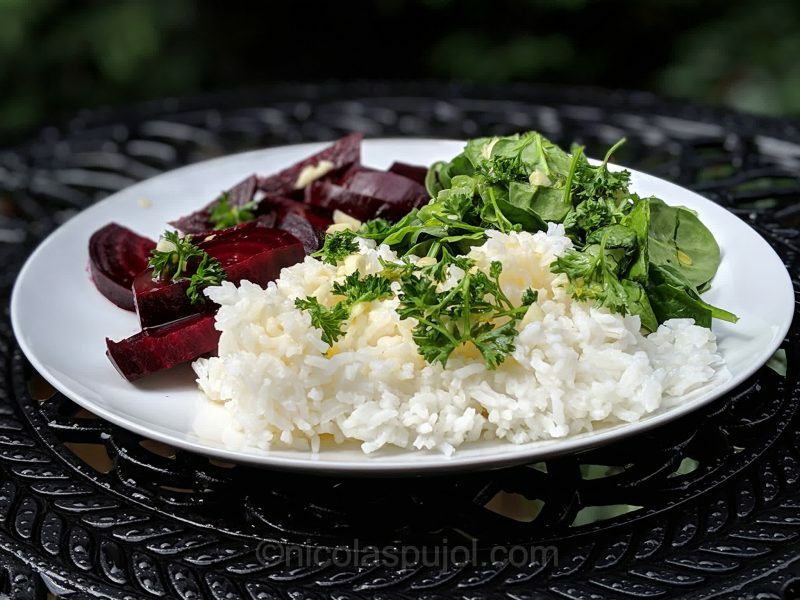 Cook the rice and beets in separate pans. In the meantime, prepare the oil-free orange vinaigrette. 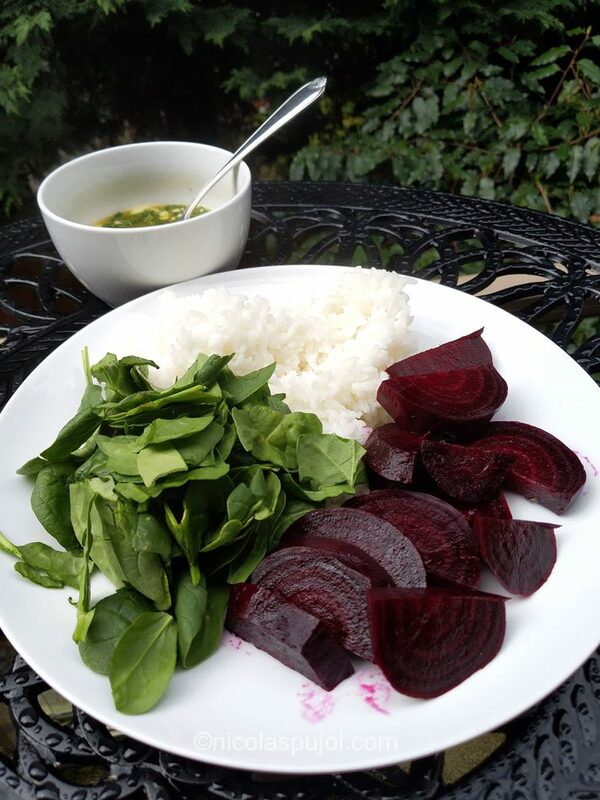 On each plate, divide the rice, beets and spinach, and add the vinaigrette as seasoning on top.